Where you live is as important as how you live. Make your move to the Alexan West Dallas, and improve your outlook. Find the floor plan that is looking for you. Whether you love the flow of open layouts or the space of multiple bedrooms, you’ll find it here. But you will find more than space. Luxury apartment features abound and surround you. Each is created for your personal comfort – but luxury doesn’t stop at your door. Indulge your friends and hang out with your neighbors when you enjoy the community amenities. Each space is optimized for socializing and relaxing – make your weekends spectacular! Location, location, location is still the name of the game and your new neighborhood has plenty to offer. Your favorite hangout is just around the corner. Plan a night out and hit that restaurant everyone has been talking about down the street. Life’s waiting for you. 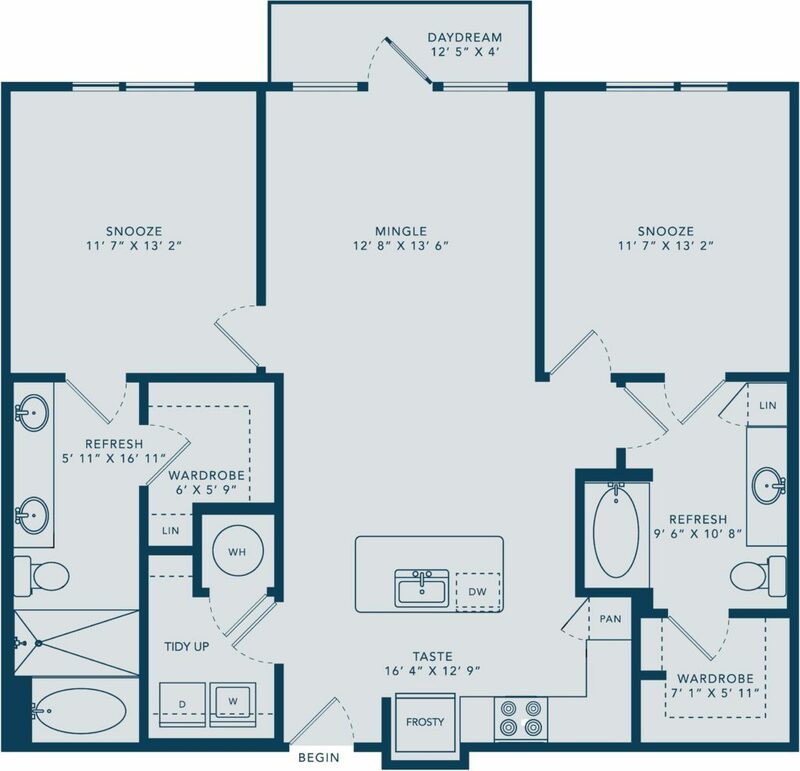 When you choose The Trend-Setter 2bed/2bath you get more than just 1,151 square feet of space. This feature-filled luxury apartment home greets you with your gourmet kitchen. Dare yourself with a new recipe, your gourmet kitchen can handle it. Just off the kitchen is your laundry niche, powerful enough to shrink laundry day into an afternoon. Your dining and living area flow from your gourmet kitchen and offer a cozy private balcony to enjoy. Both bedrooms are accessible from the living area. Your master bedroom enjoys a private spa bath with access to an oversized wardrobe. The guest bedroom shares access to your second spa bath off the living area. Your second spa bathroom offers an oversized wardrobe that is perfect for prepping for a night out. With all this space, you can host the next big party with plenty of room for overnight guests. Perfect place and perfect space. Enjoy this West Dallas 2 bed/2 bath when you choose the Alexan West Dallas as your new home. Find the luxury apartment home that is looking for you.